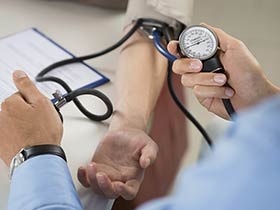 Women with pregnancy-associated stroke were more likely to have preexisting hypertension and infections at admission. BOSTON — The risk for pregnancy-associated stroke is increased in women with chronic hypertension or underlying prothrombotic conditions and infections, according to research presented at the 2017 American Academy of Neurology Annual Meeting in Boston, April 22-28. Investigators from New York Presbyterian Hospital at Columbia University in New York City and Massachusetts General Hospital in Boston conducted a retrospective case-control study of women with preeclampsia. Women with preeclampsia and pregnancy-associated stroke were considered cases and were matched 1:3 to controls with preeclampsia on age, race/ethnicity, and disease severity. Of the total number of women admitted (N=3,373,114), 88,859 had preeclampsia, and 197 of these women had pregnancy-associated stroke. Among the cases, 182 (92.4%) strokes occurred during the delivery or postpartum after discharge, and nearly 50% (49.2%) were hemorrhagic. Cases were more likely than controls to have preexisting hypertension (odds ratio [OR], 4.1; 95% CI, 2.4-7.3), underlying prothrombotic conditions (OR, 3.6; 95% CI, 1.9-6.8), and infections on admission (OR, 2.3; 95% CI, 1.3-4.1), according to multivariate analysis. It was less likely that cases were in their second or subsequent pregnancies (OR, 0.6; 95% CI, 0.4-0.9), and also less likely for them to have twin or other multiple pregnancies (OR, 0.2; 95% CI, 0.1-0.6). Miller E, Gatollari H, Too G, et al. Risk factors for pregnancy-associated stroke in women with preeclampsia: a case-control study. Presented at: 2017 American Academy of Neurology Annual Meeting. April 22-28, 2017; Boston, MA.